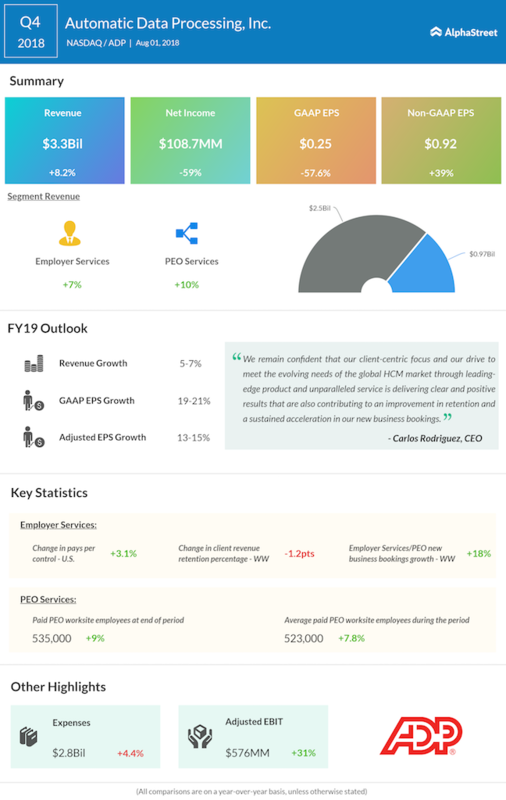 HR services provider Automatic Data Processing (ADP) today reported a steep 59% decline in Q4 2018 earnings. This decrease was mainly due to the impact of pre-tax charges of $365 million related to the company’s Voluntary Early Retirement Program and other transformation initiatives. Shares of ADP dipped more than 3% when the market opened today and continued to trade in the negative territory. The company’s earnings fell to $108.7 million or $0.25 a share from $265.8 million or $0.60 a share in the year-ago quarter. However, on an adjusted basis, the company’s earnings increased 39% to $0.92 that topped analysts’ estimates of $0.90 a share. Revenue during the quarter rose 8% to $3.32 billion in the quarter, in line with analysts’ estimate. Worldwide bookings from new business increased 18%, indicating expansion of the company’s client base. 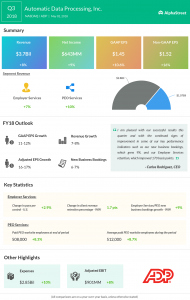 Employer Services division, which used to provide HR management solutions, witnessed a 7% increase in revenues. However, the client revenue retention was down 120 basis points. Co-employment division PEO Services revenue climbed 10% compared to last year, driven primarily by an 8% increase in average worksite employees for the quarter. On July 31, the company acquired Celergo, a provider of global payroll management services. This deal is said to enhance ADP’s international payroll offerings. Financial details of the deal remain unknown. Looking ahead into fiscal 2019, the company expects revenue growth to be about 5% to 7% and adjusted EPS to grow between 13% and 15%.